Grow the beans and enjoy! Find the game on some of our casinos, get the best welcome bonuses and you are ready to rock and roll! It is always a brilliant idea to use old stories as a plot to an online slot video game. 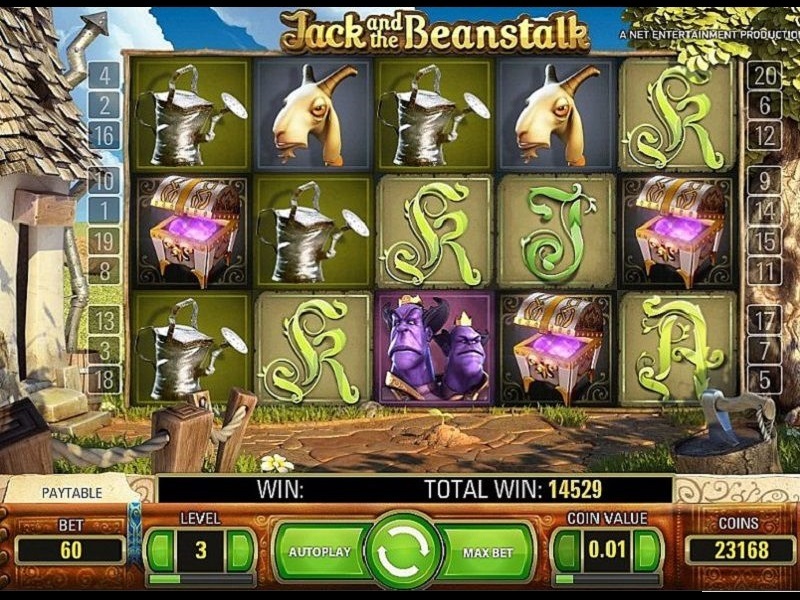 This time, Net Entertainment decided to go with and create Jack and the Beanstalk slot, something that is definitely one of the most played in the slots world. Jack and the Beanstalk is a story where a boy plants magical bean seeds that grow up beyond the clouds. He climbs the magical bean and meets many interesting things there, few of which are the giant who doesn’t let him take the treasure and his wife who is his aid, just to reach the magical kingdom. The game has five reels and 20 paylines at your disposal, and to start playing it, you will need to select one of the casinos that are located on the side of this article. Choose the one with the best promotion and the one that suits you the most to enjoy your gaming more. 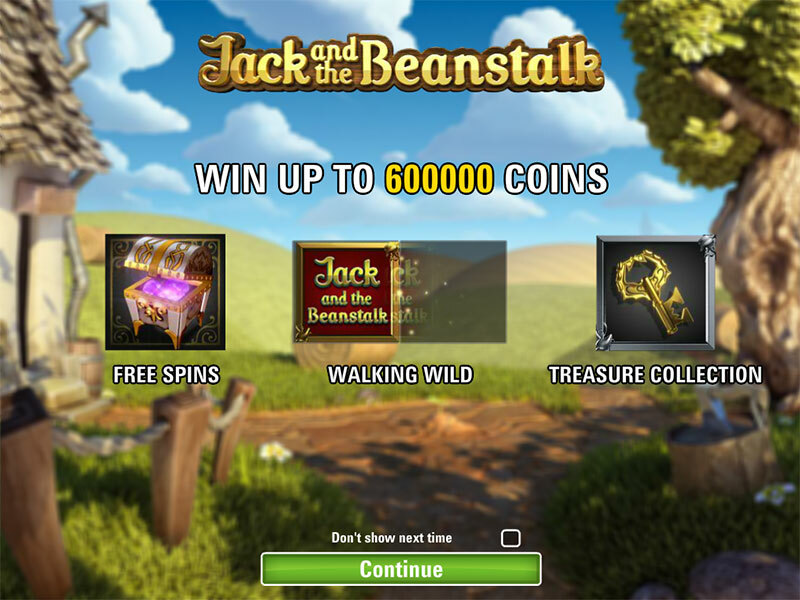 Jack and the Beanstalk slot has an RTP of 96.30% and you can start your spins with as little as 0.01 coin value. Help Jack as he helps you to reach the kingdom where lucrative wins are expecting both of you. One of the most fantastically looking games is finally here, at Gate Slots. Enjoy Jack and the Beanstalk Slot, and don’t forget to turn your volume all the way up as there are interesting sound effects and heralds to the big wins. As soon as you enter Jack and the Beanstalk Slot, a video will play explaining the story and giving you a little bit of introduction about the game itself. You are spinning the reels set on a village background where you can see some of the usual things found in a countryside yard. The back of the screen the place where the beans will grow. The top of the screen is for the logo while we can see the paylines positioned on the side of the screen. The bottom is for the adjustable options like the bet, level of the game, coin value as well as the features like auto play and bet max, right next to the spin button. There is an interesting uplifting music that starts as soon as you play the video and go to the main game. The symbols in Jack and the Beanstalk are all related to the story. They are divided into two categories with a lower and a higher symbol. The lower symbol ones, just like in almost every online video slot game, are a deck of card inspired ones. Here, in this game, we can see that they are made out of a Beam leaves and branches, giving the game an interesting overall look that connects to the theme perfectly. On the other hand, there are higher valued symbols that are relevant to the story. As we can see, there is a watering can symbol that helps the beans grow when you hit a winning combination of it, The Axe which is used against jack by the giant and his wife, the goat that helps Jack climb the beam, the Giant and the wife as well as Jack himself as the highest valued symbol out of the normal ones. As far as the special symbols are a concern, there are three special symbols, the wild symbol which is the game’s logo and is used as a substitute for all the normal symbols that we mentioned above. It can’t form a winning combination on its own, but it is really useful in the bonus feature that we will talk about in a minute. Additionally, the scatter symbol is also a symbol that is used for the bonus feature of the game and it is represented by a treasure chest. And what does a chest needs to get open? A key! There is also a Key symbol that is used in the bonus features of this game. Read about them below. Jack and the Beanstalk is five reels 20 paylines video slot game developed by Net Ent where you can play with denomination from 20p all the way up to £100 a spin. The smallest coin value is £0.01 while 1,000 is the jackpot that you can win here. To start playing the slot game, you need to select one of the casinos which are located at the side of the screen. You should know that the casino is a very important part of your playing, as you will spend all of your time on the pages of the one you’ve chosen. That’s why we’ve selected our top casinos to be at the side of the article. See the welcome bonuses, players’ support or even read our full reviews of the same to make your choice. Once you are there, you can consider some of the features of the game. Help Jack reach the top of the beans and enter the castle with several options available on the at the bottom of the screen – We can see a Max Bet option that will start spin immediately as you click it, and it is for the most daring players and the ones that want a little more thrill and adrenaline while playing slots. It is also the best way to earn a lot of money if that is your primal goal here. If your primal goal is entertainment and relaxing time, try the “Auto Play” option where you give your index finger a rest while the reels spin for themselves and grant you lucrative wins. You can also adjust the coin value and the level of the game, however, you can only play with all the 20 paylines given by Net Ent – you can’t adjust that as you can in other slot games. The winning is a standard one – By landing three or more symbols on an active payline you will be given a prize. Let’s take a look at the symbols that give you the actual prize and how they look like. There are two Bonus Features in Jack and the Beanstalk slot and they are both triggered by the special symbols of this game. Walking Wild – This feature is triggered by landing a wild symbol after a win has been awarded. After this happens, the wild will give you a free spin and move one place left until there are no more wins, or until the wild completely exists the reels. The latter option is more likely to happen as with a combination of a wild a win is almost certain. The second Bonus Feature of this game is the Free Spins feature where you need to land three or more Scatter Treasure Chest symbols in order to trigger it. When this happens, you will be awarded 10 Free Spins with the chance of extra five symbols, together with three Treasure Chests. Nine Keys – The Next Wild transforms into a big golden harp that will expand across the reel and award lucrative wins to the players. The RTP is an abbreviation for Return to Player and it indicates the amount of cash the online slot machine returns to the players over a longer period of time. This is calculated over a certain amount of spins, usually 100,000 or even a million, or in a period of time, like a year or more. This number always has to meet what the providers have stated or the law will come to the players’ justice. Jack and the Beanstalk RTP is 96.30%! 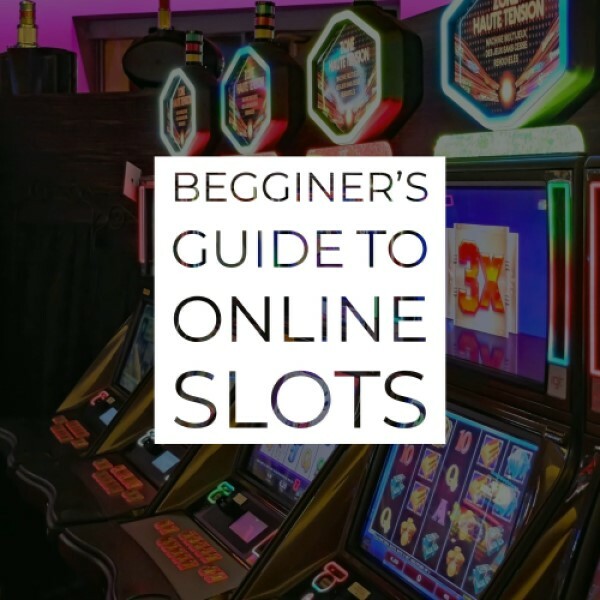 This is more than acceptable and more than the online slots average by more than one per cent, and that’s a lot in the casino world. If you want to read more about the RTP and how it functions, as well as which games have the best RTP percentage, check our Detailed RTP Guide. The demo version of every slot game is a really important factor to play before the original one for several reasons, especially if you face a game that you haven’t played before. The demo version is basically the same as the original one – you have the same symbols, same screen and the same features and options. The denomination is the same, however, you are not depositing any funds to play it, but you are playing with credits that are given to you from the site rather than your own money. This is a pretty useful feature to play when you are about to try a slot game for the first time and you are unfamiliar with everything that’s happening on the screen. You can either start the original game directly, or you can spend some time to check out the symbols, how the game works and get to know Jack and the Beanstalk slot a bit better, without spending a penny. This is why Jack and the Beanstalk demo version is important and should be played before the original slot game. As one of the best Net Entertainment games, we strongly suggest you try Jack and the Beanstalk Slot on our site, claiming the bonus feature and free spins that we offer. Join Jack in his search of the treasure by climbing the Beanstalk and passing obstacles. Spin the reels and have the possibility to land lucrative wins in the base game, a bonus feature and the free spins feature.